The terminology surrounding paranormal activity is complex, vague, and contested. For example, the word spirit means different things from culture to culture. And, it can mean something different to a religious leader, folklorist, or a parapsychologist (and so on). The definitions I am working with, then, are very limited: westernized and influenced by parapsychology. I hope in future posts to pull apart the word “ghost” in various cultural contexts. I guess I have to buy more ghost books (oh darn). The following is a brief overview of ghost and spirit key terms and concepts. What is not covered is scheduled for a future A Repository for Paranormal Knowledge post. Spirit: “discarnate being, essence or supernatural force of nature” (Rosemary Ellen Guiley). 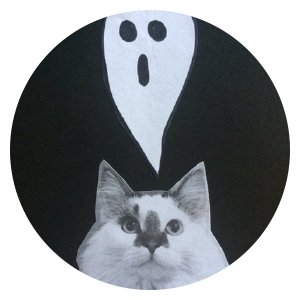 Ghost: spirit of a dead person or animal that appears to the living. Apparition: “It is characterized by the apparent perception of either a living being or an inanimate object without there being any material stimulus for such a perception. The person experiencing the apparition is awake, excluding dream visions from consideration” (Wikipedia). Residual Haunting: Sometimes called a “place memory” or “echo ghost,” these hauntings are a playback of past events. The location experienced intense emotion, causing energy to embed itself in the environment. This energy has no consciousness and is just repeating past behaviors. For example, a female ghost that repeatedly stares from a bedroom window. Intelligent Haunting: These hauntings involve ghosts with a conscious awareness of the present world. They can interact with humans (if they want) and sometimes even through communication. Sometimes these ghosts can be negative, because that was their personality when alive (does not make them a demon). These ghosts may have unfinished business, have a desire to stay near loved ones, or possibly are unaware they have passed on (and need help doing so). Poltergeist Haunting: Translated from German as “noisy ghost,” these are mischievous spirits or energy. Apparitions are not part of this phenomenon, but they make their presence known with loud noises, moving objects, or physical interactions. These energies have been attributed to ghosts, demons, or witches. In more modern times, poltergeists are associated with an “unconscious type of psychokinesis” (Rosemary Ellen Guiley). Poltergeist activity is usually centered around one person (known as the epicenter), who is experiencing high levels of stress or emotional angst (most often adolescent girls are the target). These experiences can suddenly come and go. Demonic Haunting: In these dangerous situations, a demon (inhuman supernatural being) hopes to break down a person’s free will so to possess their body. An exorcism is required to rid of the demon. Next in the Repository of Paranormal Knowledge series are 2 more interesting types of paranormal activity: artificial ghosts and ghost lights. These terms will be added to the Glossary page.